In the last year I’ve had all kinds of frightening new experiences. Around the time that an anti-Israel billboard went up along Highway 680, for example, I was called out to investigate a report of a flyer demonizing Israel on cars in the area. Looking into this anti-Zionist incident took me to a space where I was literally afraid I’d be murdered for being Black. While out in the field, I let a co-worker know where I was in case I vanished. I even sent her my GPS location pin, because, where I was, they’d never find my body. I’ve developed a habit of scanning the block before I enter the first of two secured doors into my office building, which so boldly and publicly exists for the Jewish people. I’m on high alert now. It could be anti-Semites looking for their next hate crime fix. Or it could be the radical left aggressing to express their outrage at Israel or it could be the radical, Jewish right, fed up with a dove working hard for a Democratic Israel and living in peace alongside her Palestinian partner. The people I'm on alert for are not easy-to-identify rouges. Nor are they hate-espousing figureheads, easy to distinguish from those committed to building community. These are my neighbors. The other day a woman called to me from across University Avenue in Berkeley. I stopped and waited as she crossed the busy street and then asked me if I was the one representing the Jewish community at a recent City Council meeting. This was a perfectly ordinary looking woman. When she asked, I stood taller and said that, yes, I was. Her response: “Well, I’m on the other side—we’re enemies.” Enemies. For the first time in my adult life, I have enemies. There is so much hate. There is so much fear. There are so many guns. And there is so much anger. It’s hard to walk out of my front door each morning and feel safe. And it’s really hard to navigate complex community-relations issues and build meaningful coalitions when I can barely keep my chin up simply existing in the world. For the first time in a very long time I am afraid to show public signs of affection toward the woman by my side. There is nothing bullet proof about my intelligence or strength. But, each morning, I try to get grounded in my purpose. I call into my mind all who hold me close, so I can be strong. I envision all of our children who need us to make this right. We are the ones who must hold us together. Less than two weeks ago, a colleague of mine, who is a rabbi and wears a kippah, told me that on his way to our meeting someone called out of a car, “F***ing Jew.” Just screamed it at him. And earlier this month, I saw a flyer defaced in pen with the words, “No Jews” – just one of 40 such instances reported to us in the East Bay the last four months. Note: This post marks "Day 3" of JCRC's #18days Against Gun Violence. Please, Help Us Take Action! 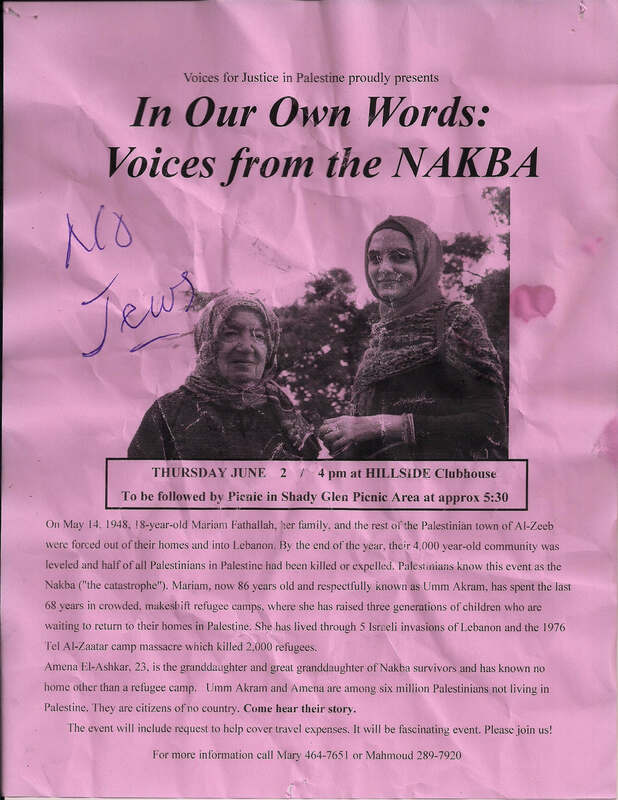 PHOTO: ‘Voices for Justice in Palestine’ Walnut Creek event flyer defaced with the words, “No Jews” (June 2016). Click here for full flyer.